Second Lieutenant, 27th Light Cavalry. Killed Accidentally in Rawal Pindi, India on the 1st September 1919 aged 19. Buried in Rawalpindi War Cemetery and remembered on the Dehli War Memorial. Rawalpindi War Cemetery, Islamabad, Pakistan contains 257 Commonwealth burials of the First World War, connected mainly with the operations on the North-West Frontier. Born in Lewisham London. Son of Hubert and Alice Russell of South View Leigh. 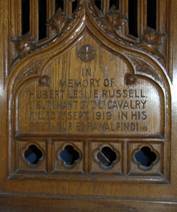 Hubert Leslie Russell is commemorated on a carved prayer-desk in St. Mary’s Leigh.